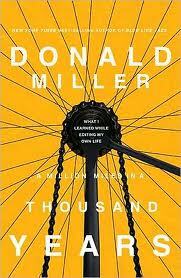 My husband is doing a book club series for the summer, and this week’s selection is Donald Miller’s A Million Miles in a Thousand Years. In this book, author Donald Miller explores the idea that the qualities which make a good story are the same qualities that come together to make a good life. When you look at your life, what do you see? Would it make an interesting story? Would it make a good story? Is it a story you would want to tell? Is it a story you would want others to tell? God uses “inciting” incidents in our lives to prompt us to make the changes we need to make in order to live a better story. These incidents could include the loss of a relationship, loss of a job, gaining of a job, birth of a child, unexpected illness or injury, or, in Miller’s case, the opportunity to turn his life into a screenplay. God used an inciting incident in Paul’s life as he walked the road to Damascus. Confident in his role as persecutor of Christians, Paul (then Saul) was brought to his knees by Christ himself and chose, in that moment, to be transformed and to live a better story. Our life is about living a story. And, as did the disciples long ago, when we go to the Lord in prayer, he will go over everything in our stories, sorting out the tangles and untying the knots. So I have to ask: Are you living a better story? Oooh that book is on my to read list. I love the idea of living a better story, sometime too, I think the story is there…I'm just not necessarily seeing it because I am so distracted by so much other stuff. It is my turn to pick for book club next month, and I've been dying to read this. . .Ugh, this post made me want to buy it now! Jenn, you are so right about being distracted by all the other stuff and not seeing the story. I always picture myself going around surrounded by this "me" bubble that I need to just pop! I liked that book a lot — Donald Miller is a rock-star writer!As for the inciting…you've got me thinking. When I look back at my life, some of the most tumultuous experiences were the ones that in the end moved me closer to God. Sometimes I wish I were better able to see the miracles when they are happening at the time…but I'm grateful to look back and see that He had been there all along.